Success needs courage – and passion. Both of these qualities were demonstrated by Henry E. Steinway, the company founder. Success needs courage – and passion. Both of these qualities were demonstrated by Henry E. Steinway, the company founder. Born in 1797 with the name Heinrich Engelhard Steinweg in Wolfshagen, situated in the Harz Mountains of today’s North Germany, he built his first string instruments at the young age of 20. In 1825, just five years later, he established his own workshop in Seesen. However, since it was only permitted to repair instruments there, he secretly produced his first grand piano in the kitchen of his house in 1836. This instrument, which became known as the “kitchen piano,” incorporated many pioneering developments for building grand pianos – such as the construction of a soundboard bridge made from a single piece of wood. For Heinrich Engelhard Steinweg, the completion of this grand piano was without doubt one of the most significant moments of his life. After all, it was the first time he acted on his vision to build the best piano possible, laying the foundation for his later fame. From the outset, Heinrich Engelhard Steinweg let himself be guided by his pioneering spirit. What mattered most to him was advanced technology and, above all, an excellent sound. By 1850, he had already brought 482 instruments to market in Germany. Nevertheless, he decided to set off for America in order to further the development of his designs. Not least because of the economic and political situation, America seemed to offer the best conditions for this. On June 29, 1850, he arrived in New York with his family. Here Heinrich Engelhard Steinweg became the entrepreneur Henry E. Steinway. On March 5, 1853, he founded the company Steinway & Sons with his sons C. F. Theodore, Charles, Henry Jr, William, and Albert. They would go on to set a new benchmark in the construction of grand and upright pianos of the highest quality. Steinway & Sons quickly built up a solid reputation in America and was set to conquer the market and the world’s concert stages in next to no time. Passion and the courage to be innovative have decided the development of the family business. Henry Sr and his sons built the first square pianos almost all by themselves, and by 1855 the instruments had already won their first award for high quality as part of the American Institute Fair at the New York Crystal Palace. When the first patent for impact mechanics was registered in 1857, the piano world saw that magnificent pioneers were hiding behind the Steinway name. And it is not without good reason that the company is considered to be the founder of modern piano construction: it has since developed 127 additional patents. No fewer than 45 patents were down to C. F. Theodore Steinway, who was the only son of Henry not to travel to America so that he could continue business with the remaining stock of pianos in Germany. He did not follow his family until 1865 after the death of two brothers, Henry and Charles Jr, when he would go on to create groundbreaking piano designs. In this way, piece by piece, the grand piano as we know and love it today came together in terms of design, touch, endurance, and perfection. In 1866 William Steinway, the man considered to be the marketing genius of the company, put one of his brilliant ideas into action by founding Steinway Hall in New York – a building with a concert hall for 2,000 people as well as dedicated sales areas that quickly became a cultural center. He also took the most famous artists of the day to America for the first time and sent them on tours, some of them with an exhausting schedule, in order to raise awareness of the instruments. For example, Anton Rubinstein gave 215 concerts in 239 days in the early 1870s, which sapped him of all his energy but brought thousands of Americans into contact with the piano and classical music. In 1871 Henry E. Steinway died. His sons continued the business in his spirit. In 1880 the time came to live up to the growing reputation of Steinway & Sons outside the borders of America. C.F. Theodore and William Steinway set up a second factory in Hamburg, and this remains the only other production site in addition to the one in New York to this day. While the factory in New York is responsible for the American continent, the rest of the world is supplied by Hamburg. Three criteria are crucial when it comes to the quality features of an upright or grand piano: the design, the production techniques, and the materials. From the very beginning, Steinway & Sons has been dedicated to fulfilling these criteria without compromise, developing the exclusive Steinway system, which is used to construct every instrument in the New York and Hamburg factories. Each piano is treated with the respect due to a masterpiece as soon as it starts to take shape. The challenge is to make each instrument perfect in its own way – a perfect Steinway. In the New York and Hamburg factories, everything is governed by the philosophy of company founder Henry E. Steinway “to build the best piano possible” – back then and today. 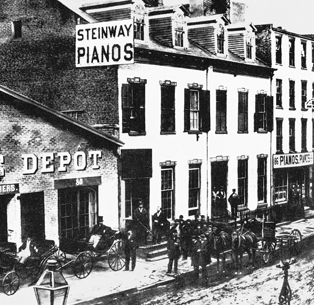 Steinway & Sons was founded in 1853 by Henry E. Steinway and his sons in New York. Together they established a new benchmark in the construction of grand and upright pianos of the highest quality. Having developed more than 125 patents, the company is considered to be the founder of modern piano construction. 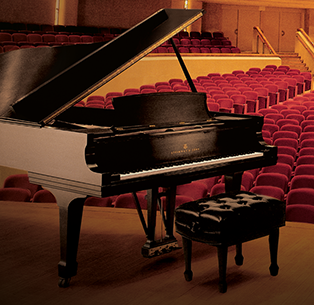 Each Steinway grand piano a unique masterpiece produced by the hands of craftsmen. We take our time in production – everything is done quietly and with care. Since our company was established, we have produced pianos with great attention to detail. Each Steinway piano is a work of art that begins with the selection of the finest materials and is brought to perfection with great passion. On average, wood is left to dry and age for two years and it takes almost another year to manufacture a Steinway. Since our company was established, we have produced pianos with great attention to detail. Each Steinway piano is a work of art that begins with the selection of the finest materials and is brought to perfection with great passion. On average, wood is left to dry and age for two years until they can be processed in the optimal way. It takes almost another year to manufacture a Steinway.